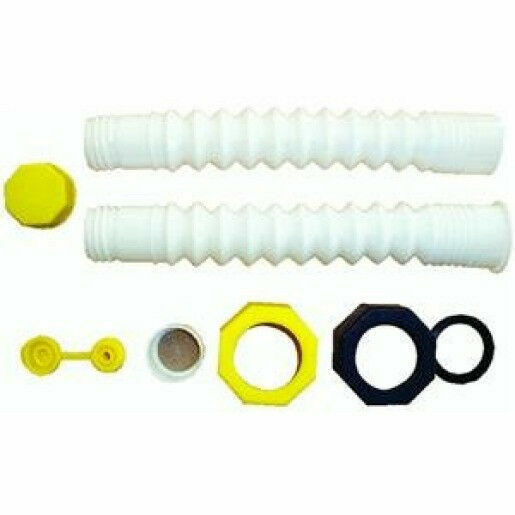 Yellow cap is coarse thread and typically fits Midwest, Scepter and our Chilton adapter, Jerry can adapter, No Spill adapter, and Racing Jug adapter. Spout and cap. 8″ spout extension for those hard to reach tanks. Purchased subject replacement spout kits for old Gott gas container's I purchased in the early 90's The original spouts had become brittle and broken long ago. These replacement spouts have the same thread configuration as my Gott container's.. They supply you with two types of threaded spout retainers which should cover most thread configurations. The spouts have a larger diameter so you pour more volume in a lot less time. Souts are a heavier gauge plastic than my originals yet still flexible. I've only had mine several month's so only time will tell..
Works great no leaks and with the extension can get into the tank easier with no spillage. And the new white color rather than black, helps to see the liquid movement as well, though clear would be even better.